Tonight I received the sad news that Dave died yesterday, 31st December, 2011, in the hospice at Ulverston. 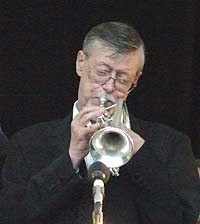 He was a kind, funny man who played a lot of trumpet, and will be sorely missed by his friends and everyone who enjoyed his playing and his personality on and off the bandstand. He and I played together so often over a period of about 15 years that we got to that nice point where we each knew what the other was thinking - that doesn't happen often, but when it does some great music can come out. That is sad news Steve. I'm only just coming to terms with the knowledge of his illness and now this. After San Sebastian with the Newcastle Big Band, I lost touch with Dave although, in those in-between years I acquired a double CD of the Midnite Follies Orchestra - It's All Ellington - that had Dave in the trumpet section. I'll play that CD tonight and raise a glass in his memory.